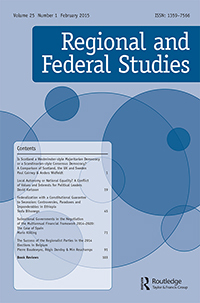 Baudewyns Pierre, Dandoy Régis, Reuchamps Min, “The Success of the Regionalist Parties in the 2014 Elections in Belgium”, Regional and Federal Studies, vol. 25, n° 1, 2015, pp. 91-102. In May 2014, and for the second time in her political history, regional, federal and European elections were organized simultaneously in Belgium. In the direct follow-up of the sixth state reform, which increased the powers and autonomy of the Belgian Regions and Communities, these elections were crucial for the future of the country and for the multi-level coalition formation at the regional and federal levels. The political campaign was dominated by socioeconomic issues and demands for further autonomy, particularly in the Flemish region. Regional electoral results confirmed the success of the regionalist parties in Flanders, but also in Brussels and in the German-speaking Community. These successes allowed regionalist parties to enter all regional and federal governments—often as the dominant party—with the exception of the Walloon and the French-speaking Community cabinets.